Lactic acid bacteria are of great importance for the food and biotechnology industry. They are widely used as starters for manufacturing food (e.g., yogurt, cheese, fermented meats, and vegetables) and probiotic products, as well as for green chemistry applications. 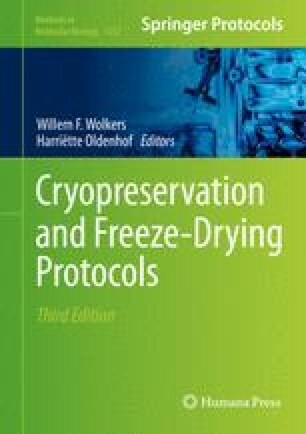 Freeze-drying or lyophilization is a convenient method for preservation of bacteria. By reducing water activity to values below 0.2, it allows long-term storage and low-cost distribution at suprazero temperatures, while minimizing losses in viability and functionality. Stabilization of bacteria via freeze-drying starts with the addition of a protectant solution to the bacterial suspension. Freeze-drying includes three steps, namely, (1) freezing of the concentrated and protected cell suspension, (2) primary drying to remove ice by sublimation, and (3) secondary drying to remove unfrozen water by desorption. In this chapter we describe a method for freeze-drying of lactic acid bacteria at a pilot scale, thus allowing control of the process parameters for maximal survival and functionality recovery. This work was supported by the National Institute of Agronomic Research (Paris, France) and by the Paris Institute of Technology for Life, Food and Environmental Sciences (AgroParisTech, Paris, France).